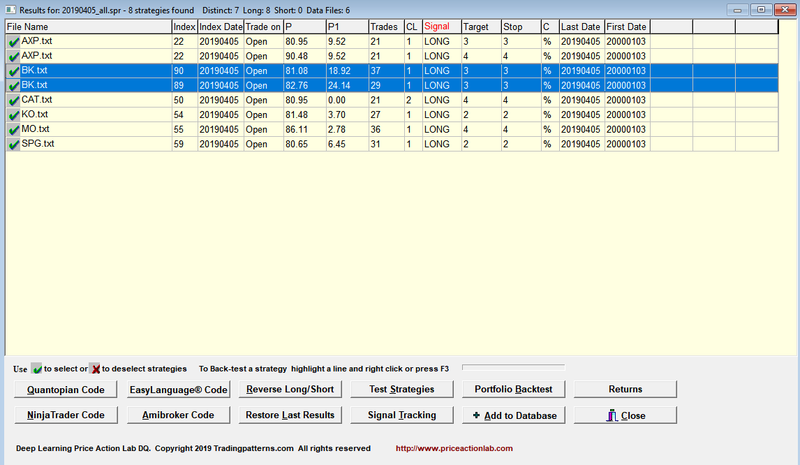 As of the close of Friday, April 5, 2019, DLPAL DQ generated two long signals for BK. The stock gained 0.73% from open to close of Monday, April 8, 2019. This is another example of multiple signal validation. Results of DLPAL DQ for 84 large caps we scan daily are shown below. Details of workspace can be found here. The results include all raw signals. Multiple signals were generated for BK from two different strategies and for AXP, due to same strategy but different profit target and stop-loss. Below are the returns for next trading day after the excess raw signals were removed. We usually keep the signal with smallest profit target and stop-loss when removing excess signals. BK gained 0.73% from open to close of next trading day. Also AXP gained but just 0.072%. Some of our professional customers think multiple signals offer a good validation method especially when combined with discretionary analysis. Some of them utilize ITM options in an attempt to take advantage of these signals.